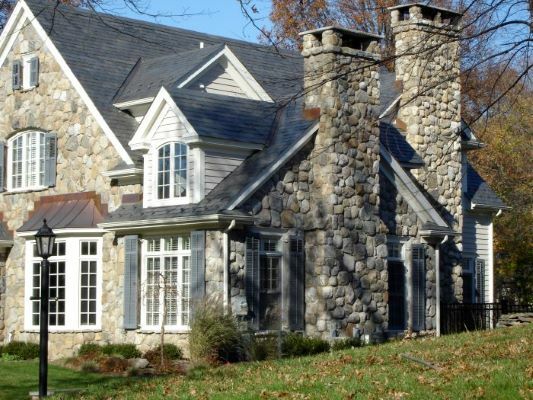 Specializing in traditional stonework and located in New Jersey, J.W. Bennett Stonework & Masonry is a custom masonry company offering a wide range of services. Not only are we well known for our New England Fieldstone, our masons spend much of their time working with Bluestone, Limestone, and other natural materials. Our New Jersey Masons also have years of experience constructing full masonry fireplaces and chimneys. J.W. Bennett Stonework & Masonry offers the highest quality custom masonry craftsmanship available today. Please do not hesitate to contact us for pricing and other information about stonework, patios, walks, front steps, fireplaces and chimneys, or any other masonry projects for your home. Thank you for all of your great work. We have received many compliments on both the sidewalk and the two walls. Everything looks great. We also really appreciate that you replaced the stone on our back wall and sent one of your guys to do some repairs on the chimney. We very much appreciate your thorough clean-up and your good nature. We hope we'll have another project for you soon. We wish you much success and again, thank you for a job well done."